Monday, 12/22/14, there was a weather front approaching our area, and winds, though calm in the early morning, were predicted to pick up, with seas rising as well. Bradley Miller had a choice between trying to beat the worst of the wind and fish offshore, or playing it safe in the backwaters. He decided to fish offshore. We had a great morning of fishing and caught a bunch of fish, all in shrimp. It was worth putting up with 3-foot seas, and we were back to the dock before they got any worse than 3-foot. Bradley released a dozen out-of-season red grouper, two of which were would-be keepers at 22inches and 23 inches. He also released two beautiful gag grouper, also out of season currently, at 25 and 25 ½ inches. Brad also caught seven mangrove snapper, three of which were keepers at about 13 inches each. He also caught a 13 ½-inch hogfish and eight good-sized grunts, and released two porkfish. Tuesday, 12/23, Ed Bernicke and Daiva Lenauskas filed the backwaters in lower Hickory Bay with me. The couple used live shrimp to catch fifteen mangrove snapper, nine of which were keepers to 13 inches. They also boxed two keeper sheepshead at 13 inches and 15 inches, and released five smaller sheepshead, along with two crevalle jacks. Christmas-eve morning, I fished the backwaters, along the east wall of Estero Bay, with Brian and Julie Clark. It was a windy morning, ahead of a cool front that was to bring rain later in the day, but the tide was favorable, and the couple had some great redfish and sheepshead action. Using live shrimp, Julie caught and released a brace of 29-inch bull reds (slot-size is 18-27inches.) The second of those was caught on 8-pound test, which was a challenging battle, for sure! She also caught an 18-inch sheepshead. Brian landed a keeper 25-inch redfish, along with a 15-inch sheepshead. The couple released a few short sheepshead and mangrove snappers, along with a trio of two-pound stingrays. Christmas-eve morning, I fished the backwaters, along the east wall of Estero Bay, with Brian and Julie Clark. It was a windy morning, ahead of a cool front that was to bring rain later in the day, but the tide was favorable, and the couple had some great redfish and sheepshead action. 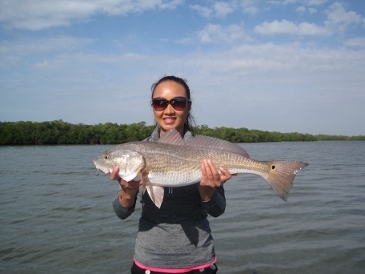 Using live shrimp, Julie caught and released a brace of 29-inch bull reds (slot-size is 18-27inches.) The second of those was caught on 8-pound test, which was a challenging battle, for sure! She also caught an 18-inch sheepshead. Brian landed a keeper 25-inch redfish, along with a 15-inch sheepshead. The couple released a few short sheepshead and mangrove snappers, along with a trio of two-pound stingrays. Thursday, Christmas Day, and also the day after Christmas, were reserved for family events, off the water. Clement and Evelyn Wong, and son, Joshua, fished offshore, 18 miles west of New Pass with me on Saturday morning, 12/27. It was foggy nearly the entire morning, but seas were calm, and the family had some good snapper action, culling twenty keeper mangrove snapper to 15 inches. Evelyn landed a nice, 17-inch hogfish to add to the box, and the group also boxed four 14-inch whitebone porgies. They released a small gag grouper, along with four 18-inch red grouper. Monday morning, 12/29, I fished 18 miles west of New Pass with Brad and Amanda Clemmons and Amanda’s parents, John and Debbie McCracken, along with friend, John Lyons. The group used live shrimp to catch fifteen whitebone porgies to 18 inches, seven mangrove snapper to 14 inches, and a dozen good-sized grunts. They also caught eight red grouper to 26 inches, two of which were keeper-size, but all of which had to be released due to closed season. Tuesday morning, 12/30, I headed back out 18 to 20 miles from New Pass with The John Duritsh family—John, Eric, Dave, Tim and Matt. The guys used live shrimp to catch twenty nice whitebone porgies, ten nice lane snapper, all about 12 inches, and a 13-inch mangrove snapper. They released several gag grouper. Wednesday, Mike Rohrbacher and his two young grandsons, Matt and Michael Casey, spent the last morning of 2014 fishing 18 miles west of New Pass with me, using live shrimp to lure a nice variety of fish. The guys caught and released several red grouper to 23 1/2 inches, along with some small gag grouper. They got into some very nice lane snapper, and kept four of those that were 14 inches, and one just short of 15 inches, which is quite big for a lane. They added to the box a 16-inch hogfish, and a half-dozen porgies to 14 inches. They released a bunch of smaller porgies, along with fifteen short mangrove snapper. After a day off the water on New Years’ Day, I headed back offshore on Friday morning, 1/2/15, with Bob and Katie Sawyer and friend, Bill Teutsch and his son, Nick. The red grouper bite was hot for live shrimp, about 22 miles west of New Pass, and the group caught twenty-five of those, boxing three keepers, two at 21 inches and one at 23 inches. There were four others that were right about at the 20-inch mark, but a little too close to call, so we released those, along with the remaining shorts. The anglers also caught ten keeper lane snapper, all about 12 inches, and about twenty-five grunts, of which they boxed the four largest. They released a few mangrove snapper shorts. As for big-game, we hooked up with a 5-foot tiger shark, which bit a piece of a grunt, and which provided a great battle, photographs and video before we released it. It was a beautiful fish, prettiest tiger I have seen. Winds picked up Saturday morning, 1/3/15, and seas were choppy 19 miles west of New Pass, where I fished with Bob Eckle and his sons, Nick and Jason. Nick caught a beautiful gag grouper at 30 inches, which we photographed and released, due to closed season still in effect for gags. Bob released a nice triggerfish at 17 inches, and the group released lots of red grouper shorts. They also caught twenty-five porgies to 17 inches and kept a half dozen of the largest, releasing the rest, along with a couple of porkfish and some grunts. Everything bit on shrimp. The photo shown is of angler Julie Clark, with a 29-inch bull redfish, caught on shrimp and released on a recent inshore trip. SW FL-Bonita beach: Big Sheeps Return; Grouper Action Good! SW FL-Bonita Beach: Fighting Fish ...and Weather!